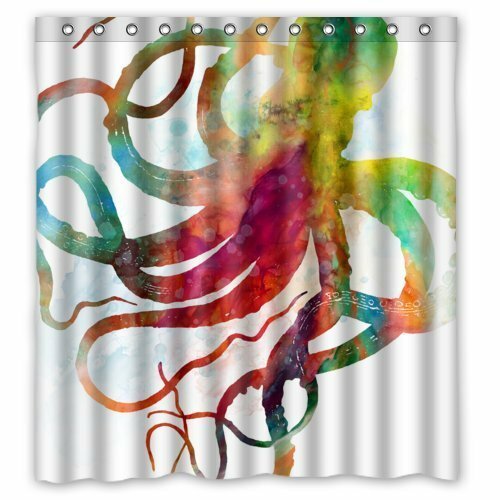 YEHO Art Gallery Stylish Living Elegant Abstract Colorful Octopus Art Ocean Animal Bathroom Shower Curtain Liner for Home with Hook 66" x 72"
(4)waterproof polyester fabric shower curtain with latest design. This material makes it very durable and it can to last for many years to come .It is tough durable fabric allows for easy cleaning. (5)Liner not needed. Shower curtain is resistant to mold, bacteria and mildew build-up. (6)Your unique design will brighten your bathroom and creat a comfortable bathing environment. Customized Bathroom Shower Curtain with 3D Printing. HEALTH AND SAFETY: Non-Smell, Non-Hardening in winter and Machine washable. If you have any questions about this product by YEHO Art Gallery, contact us by completing and submitting the form below. If you are looking for a specif part number, please include it with your message.